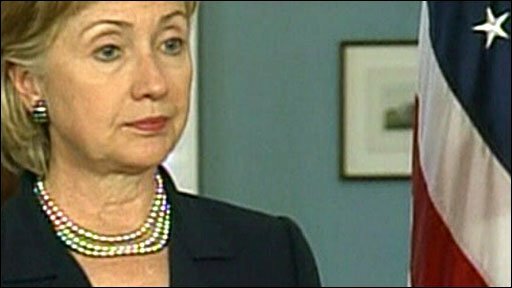 US Secretary of State Hillary Clinton has reiterated her opposition to the possible release of the Lockerbie bomber from prison in Scotland. She said it would be "absolutely wrong" for the Scottish Government to release Abdelbaset Ali al-Megrahi or transfer him to jail in his homeland of Libya. 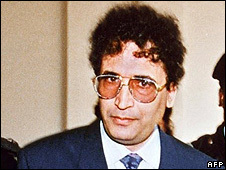 Megrahi, dying from terminal prostate cancer aged 57, dropped his second appeal against conviction on Tuesday. Some 189 Americans were among the 270 people killed in the airliner bombing. "I knew a lot of these families. I talked with them about what a horror they experienced," Mrs Clinton said. "I just think it is absolutely wrong to release someone who has been imprisoned based on the evidence about his involvement in such a horrendous crime." The BBC's Daniel Sandford in Washington called it "uncharacteristically undiplomatic language" from Mrs Clinton. "The intense pressure on the Scottish justice secretary went up a further notch with this intervention from Hillary Clinton," he said. Last week, Mrs Clinton personally expressed to Kenny MacAskill her view that the bomber should serve out his sentence in Scotland. Scotland's Finance Secretary John Swinney said the justice secretary had gone to "significant lengths" to listen to everybody's opinion on the case. He told BBC Radio Scotland: "He's obviously met with Mr Megrahi and he's listened to a whole range of different representations. "That's the right and the proper thing to do. "Kenny MacAskill is now considering the details of all of those representations and the reports which he is required to take." Mr MacAskill is due to decide within the next two weeks on an application for Megrahi's release on compassionate grounds, as well as a Libyan government request for a transfer to allow him to serve out his sentence in his homeland. Earlier this week, a letter from seven US senators including Edward Kennedy and John Kerry urged Mr MacAskill to keep Megrahi behind bars. On Tuesday, judges at the High Court in Edinburgh who accepted Megrahi's application to drop his appeal were told Megrahi's health had recently worsened very considerably. By dropping his appeal, Megrahi has removed one potential obstacle to his transfer to a jail in his homeland. Scotland's top prosecutor, Lord Advocate Elish Angiolini, will now have to consider whether that should also be dropped. Megrahi is serving a life sentence of at least 27 years following his 2001 conviction for the bombing of Pan Am flight 103 in 1988.